Smart Shield fabricates Silicone Gasket and water jet cut silicone gaskets in a wide variety of grades, thicknesses and hardness. The standard thickness of silicone rubber ranges from .010" to 1" thick. Silicone rubbers hardness (durometer) typically spans from 30 to 80 durometer, Shore A.We manufacture Rubber Gaskets & O- rings to any dimensions and in any shape from EPDM, Neoprene, Silicone & Viton Rubber. Whether you are a standard part, or something bespoke, simply give us a call or send us your drawing, and we will be happy to offer you a quotation. Smart Shield fabricates die cut Neoprene Gasket rubber gaskets and water jet cut neoprene gaskets in a wide variety of grades, thicknesses and hardness. The standard thickness of neoprene rubber ranges from 1/64" to 3/8" thick. Die cut neoprene gaskets are typically black in color and their hardness (durometer) spans from 30 to 90 durometer, Shore A. Neoprene gaskets are available with or without pressure sensitive adhesive (PSA) backing.We manufacture Rubber Gaskets & O- rings to any dimensions and in any shape from EPDM, Neoprene, Silicone & Viton Rubber . Whether you are after a standard part, or something bespoke, simply give us a call or send us your drawing, and we will be happy to offer you a quotation. Smart Shield fabricates die cut EPDM Gaskets and water jet cut EPDM gaskets in a wide variety of grades, thicknesses and hardness. The standard thickness of EPDM rubber ranges from 1/64" to 1/4" thick. EPDM is generally black in color with the exception of FDA Approved EPDM which is white. The hardness (durometer) of EPDM rubber typically spans from 40 to 80 durometer, Shore A. EPDM rubber is available with or without pressure sensitive adhesive (PSA) backing. We manufacture Rubber Gaskets & O- rings to any dimensions and in any shape from EPDM, Neoprene, Silicone & Viton Rubber . Whether you are after a standard part, or something bespoke, simply give us a call or send us your drawing, and we will be happy to offer you a quotation. Smart Shield fabricates die cut Viton Rubber Gasket in a wide variety of grades, thicknesses and hardness. The standard thickness of Viton rubber ranges from 1/64" to 1/4" thick. Viton rubbers hardness (durometer) typically spans from 55 to 90 durometer, Shore A. Die cut Viton gaskets are generally black or brown in color. 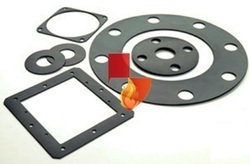 Viton gaskets are available with or without pressure sensitive adhesive (PSA) backing. We manufacture Rubber Gaskets & O- rings to any dimensions and in any shape from EPDM, Neoprene, Silicone & Viton Rubber . Whether you are after a standard part, or something bespoke, simply give us a call or send us your drawing, and we will be happy to offer you a quotation. 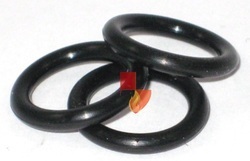 Silicone O-Ring possess excellent resistance to temperature extremes. Silicone's retention of properties at high temperatures is superior to other elastic materials. Silicone has poor tensile strength, tear resistance and abrasion resistance. 90 to 500o F (-68 to 260o C). Neoprene O-Ring has good aging characteristics in ozone and weather environments, along with abrasion and flex cracking resistance. Neoprene is not effective in aromatic and oxygenated solvent environments. Neoprene can be compounded for service temperatures of. Most elastomers are either resistant to deterioration from exposure to petroleum based lubricants or oxygen. Neoprene is unusual in having limited resistance to both. This, combined with a broad temperature range and moderate cost, accounts for its desirability in many seal applications Neoprene is resistant to refrigerants, ammonia, silicone oils, water, ozone, vegetable oils, alcohols, and low-pressure oxygen. Neoprene has a very low resistance to mineral oils. We manufacture Rubber Gaskets & O- rings to any dimensions and in any shape from EPDM, Neoprene, Silicone & Viton Rubber . Whether you are after a standard part, or something bespoke, simply give us a call or send us your drawing, and we will be happy to offer you a quotation. Excellent resistance to weathering and ozone, water and steam, with good performance in castor and some phosphate ester based fluids. It's low and high temperature capability is good, having excellent resistance to set with good resilience. Also high temperature braking systems employing castor based fluids for mouldings subjected to weathering and ozone and for seals in chemical plant due to its good chemical resistance. EPDM O-Ring is particularly useful when sealing phosphate-ester hydraulic fluids and in brake systems that use fluids having a glycol or silicone base. This results in a highly fluorinated elastomeric compound with exceptional temperature resistance, compatibility with a wide range of aggressive chemical combinations and outstanding resistance to permanent deformation. 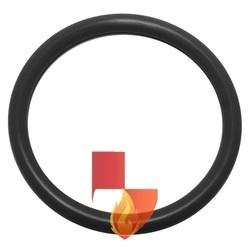 Inexpensive material for normal use, We manufacture Rubber Gaskets & O- rings to any dimensions and in any shape from EPDM, Neoprene, Silicone & Viton Rubber . Whether you are after a standard part, or something bespoke, simply give us a call or send us your drawing, and we will be happy to offer you a quotation. VIton O-Ring are widely used in chemical, automotive, aerospace and industrial applications. These compounds offer excellent chemical and temperature resistance. There are many additional specialty compounds based on A, B, F, GLT, GFLT, LTFE and ETP polymer types. We manufacture Rubber Gaskets & O- rings to any dimensions and in any shape from EPDM, Neoprene, Silicone & Viton Rubber . Whether you are after a standard part, or something bespoke, simply give us a call or send us your drawing, and we will be happy to offer you a quotation. Excellent resistance to aging and ozone. Low gas permeability, low compression set. 26°C to 205°/230°C (-15°F to 400°/440°F). IRM 902 and IRM 903. Steam, hot water, amines, polar solvents, low molecular weight organic solvents and glycol-based brake fluids. Ammonia gas, low molecular organic acids (formic and acetic acids). Looking for Rubber Gaskets & O- Rings ?